The Charlie’s Aunt pattern collection comprises 30s, 40s and 50s inspired sewing patterns for bags and other stitched accessories such as hats and purses. The “make-do-and-mend” style patterns have all been hand-drawn, illustrated and scanned in keeping with the personal and home-made ethos of the patterns of the 1930s, 40s and 50s, which form the basis for the inspiration behind the collection. The sewing patterns offer easily constructed simple designs with a retro feel, varied by adding different pleated panels, pockets and trims to change the look. Offering patterns in both PDF and printed format enables us to cover all preferences. Note: Customers are allowed to make a limited number of items from Charlie’s Aunt patterns to sell, as long as they read and digest the information on the ‘Legal’ page of this website, and stick to the guidelines. The PDF patterns contain one style of bag, but many also have instructions for trims, such as rose corsages or stitched badges, that can be used in other fashion accessory projects. The printed patterns are also available wholesale. 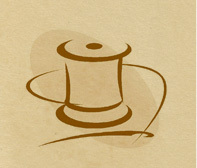 Please visit wholesalepursepatterns.com for distributor information and to see the collection. Please email emma@charliesaunt.com for more details. For distributor purchases for our printed pattern range, please visit www.wholesalepatterns.com. For wholesale purchases for our printed pattern range, please visit brewersewing.com, checkerdist.com, eeschenck.com, or wholesalepursepatterns.com. 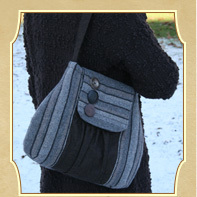 The Utility range of patterns are for smaller, more simple accessories including purses, scarves and textile jewellery. These are available in the Charlie’s Aunt Etsy shop. Become a Charlie’s Aunt fan and get regular updates about our products on our Facebook page.